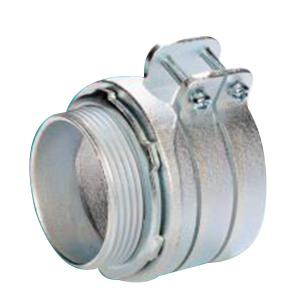 Sepco Straight cable connector of trade size 1-Inch, is suitable for use with 1-Inch knockout, armored cable and flexible metallic conduit. This connector features malleable iron construction and zinc-plated finish. It measures 1.1-Inch x 2.15-Inch. Connector with squeeze x male NPS connection, has thread length of 0.57-Inch. Connector is UL and cULus listed.